Australia Visa photo size is 4.5cm x 3.5cm. This measurement is same as 45mm x 35mm or 1.77 Inch x 1.37 Inch). How Many Photo are Needed for Australia PR? Australia PR needs 1 color passport size scanned copy for uploading to immiaccount. Australia passport size photo should show the person’s head and shoulders only with plain white color background. The person should face the camera and picture must be less than 6 months old. You can get passport size photo online at ePassportPhoto with really low prices and good quality. You can either get the photo delivered to your home at low cost in Australia or download it for free using the self click option. 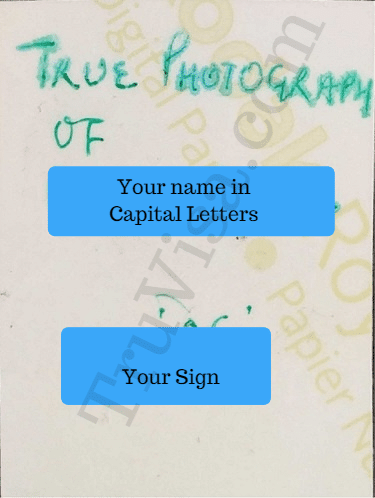 Scan both front and back of the physical paper photograph after writing your name on back. Scan and attach the front and back of the photograph of each Australia visa applicant separately. Do not place the photo on a piece of paper before scanning. You can use the excellent Google Photoscan app to scan Australia PR passport size picture. Australia PR 189 or 190 visa photo back view must be scanned showing the person’s declaration, Name and signature by hand. You should scan front and back view of image separately into two separate files. Upload as 2 separate .JPG or Image files in your immiaccount.